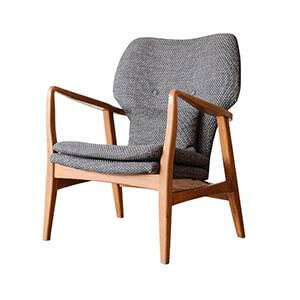 Hans J Wegner is known as the "chair master" and "the greatest furniture designer of the 20th century". 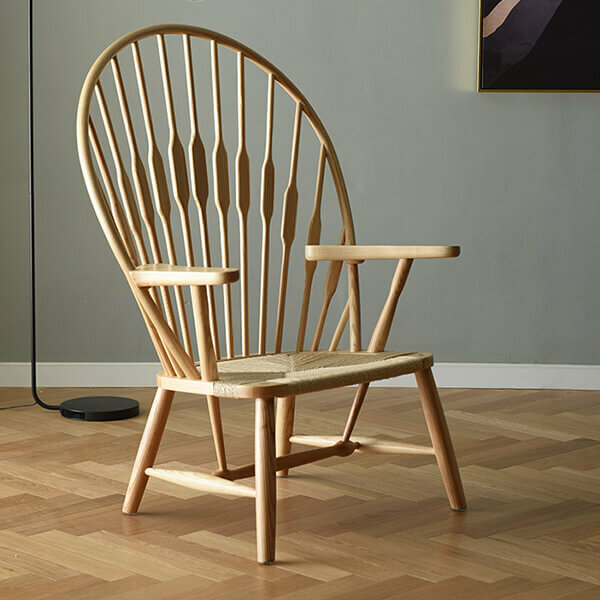 Wegner's design incorporates a strong Nordic flavor. His danish style works are scientific in structure, perfect in shape and detail. They are fully expressing the personality of materials. Solid wood like ash, oak, beech, walnut, venner and plywood are all used in his designs. It changed the mechanical indifference of internationalism. And modern aesthetics with human feelings integrated in the designs. His dining chair designs use rounded corners to give people a sense of security and intimacy. Wegner is recognized as the most creative and productive furniture designer in the world. His works are known as "eternal" and "immortal". And the chairs are treasured by the UN Building, the World Bank and design museums around the world. In 92 years life, he created more than 500 works. 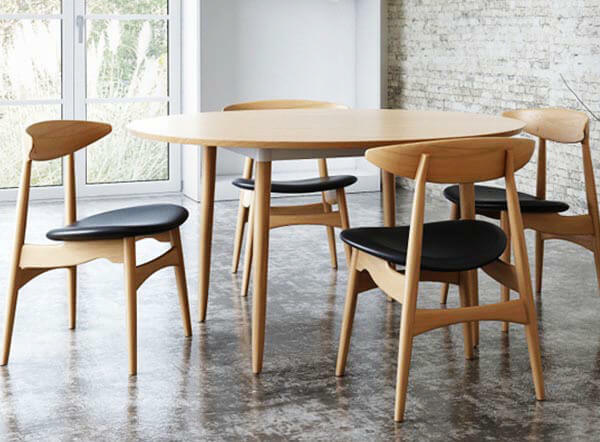 Now we are introducing 7 iconic dining chairs of Wegner. 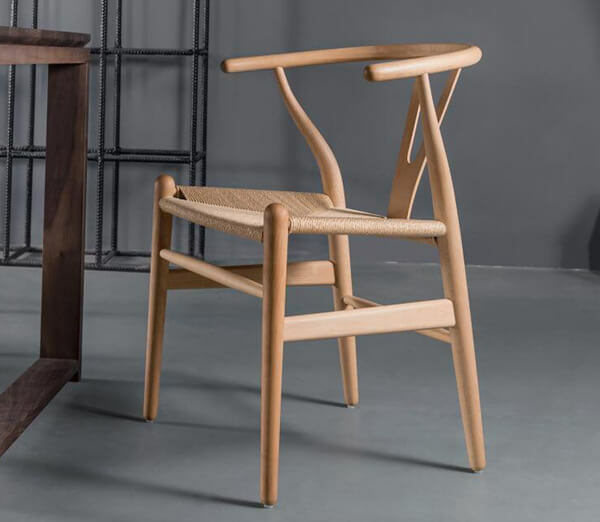 CH24 Wishbone Chair is the Wegner’s most well-known work. Its lightweight, attractive, comfortable single chair. The Y-shaped support backplane are its largest trademark. 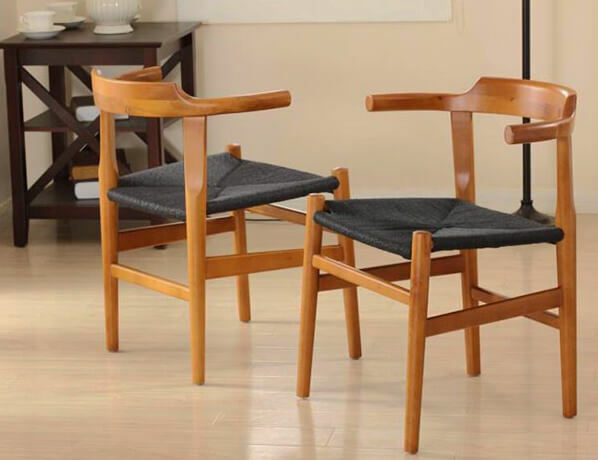 Among Wegner’s works, the Wishbone Chairs are the most widely used in China. And the color is not limited to natural wood finishes. Walnut, black, white, navy blue, cream and ivory, dark grey, teel and green, turquoise, tan and brown and yellow. We can make the colored surface as requirements. Please refer to here for more details about wishbone Y chair. Inspired by the Chinese-style chair, Wegner PP503 chair is famous for its almost perfect smooth lines and minimalist design. The whole chair is integrated from shape to components. And it has been honored as “The Chair". “A good chair takes 50 years to prove.” said by Wegner. This is the standard set up by Wegner for a good chair. Now more than 50 years has passed away. The Kennedy Chair still occupies a pivotal position in the design circle. It is regarded as "chair of chairs". 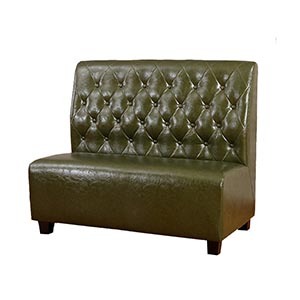 Please refer to here for more details about kennedy armchair. The famous shell chair, triple-legged chair, designed in 1963, is one of the most valuable chairs in Wegner’s life. It is simple and generous. It has wing-shaped covered armrests on both sides and curved supporting feet. Although only supported by three feet, the “smiling chair” is strong and durable. Please refer to here for more details about shell chair. Elbow Chair's four chair feet gently narrow toward both ends. That makes the overall shape lightweighted. The armrest is meandering down and the corner is slightly protruding forward. It can support the elbow to droop in the most natural position or support the upper body. The cushion is slightly bent downward to fit the radian of the body. From the front, it's just right at the golden section of the chair - the perfect proportion. The empty area between the back and the cushion gives the whole structure a relaxed and economical form. That allows the people sitting on it to adjust freely to the most comfortable position regardless of their weight. 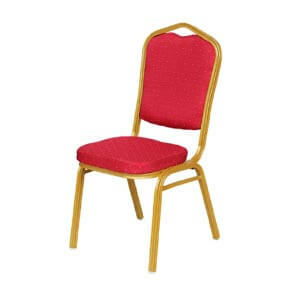 Please refer to here for more details about elbow chair. Wegner PP 58 and PP 68(rattan seat) were originally designed by Hans Wegner for DSB. The chair is designed to fit the length of the dining table. Compared with other works by Hans Wegner, the armrest of the chair is shorter and easier to put into the dining table. Please refer to here for more details about PP58 chair. Although Wegner CH33 chair appearance is simple, it is a special dining chair, comfortable and stable. This chair has a choice of wrapped cushions and wooden cushions. Wood types can be combined, such as beech frames and walnut cushions and chair backs. Design by Hans Wagner in 1957. 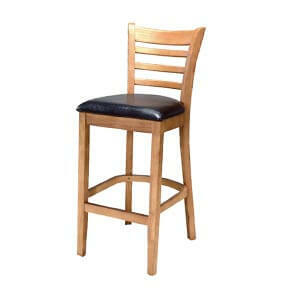 Please refer to here for more details about CH33 stacking dinning room chair. 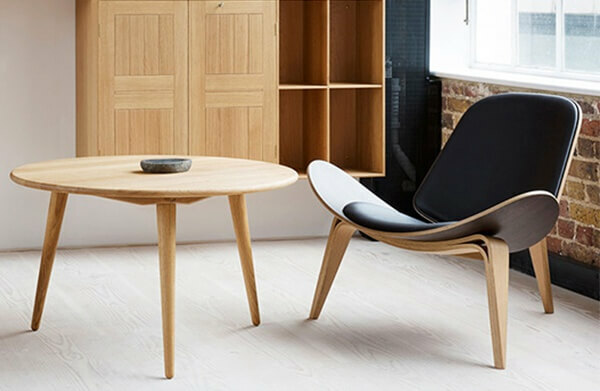 The Wegner peacock chair, famous for its elegant and refined shape. It was inspired by the traditional Windsor chair. At the same time, Wegner changed the middle part of back of traditional Windsor chair to a flat shape. That provided excellent comfort for the shoulders, and visually gave the chair a touching aesthetic feeling like an open peacock screen. The morden peacock armchairs for sale haves not only the natural wood finishes, but white, black and other color finishes meeting the home decotaton target requirements. The seat plate can be kept as original with strings or upholstered with soft cushions. 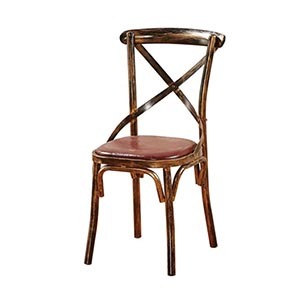 Please refer to here for more details about Wegner peacock chair. Wegner’s works are still very popular today. You can feel the pure vitality of each chair and his love of exquisite craftsmanship and pragmatic professional attitude. 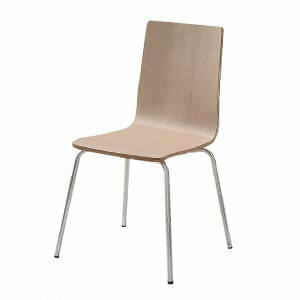 NORPEL also follow the professional attitude to produce well-made and design dining chairs in China. You’re welcomed to contact and visit us to knowing more about us. 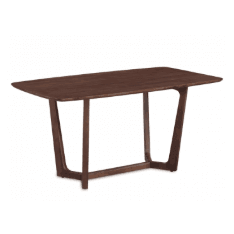 We manufactures and supplies dining room furniture worldwide. Dining chairs help to create the tone and atmosphere of a dining room. The best way to determine the type of chair for your household is to know the options. We have manufacture a comprehensive list of the most popular types and style of chairs. So to give you a hint to decide what will be best affordable dinette room chairs for your needs and for your modern home style. 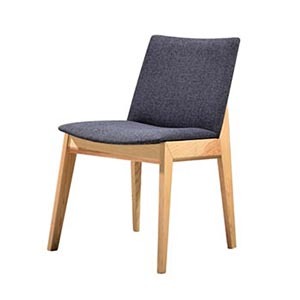 Our modern chairs, sofas and tables are not only can be used at home, but also in hotel restaurant, bistro, cafe, office reception area, canteen and other business spaces. 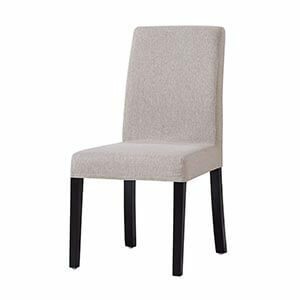 NORPEL furniture is doing our best to be one of the best company to buy dining chairs. 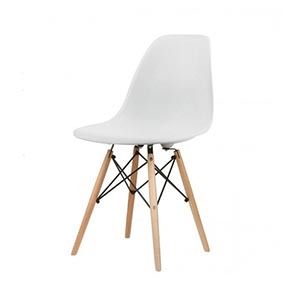 » Previous: How to Choose The Best Eames Plastic Chair Replica? 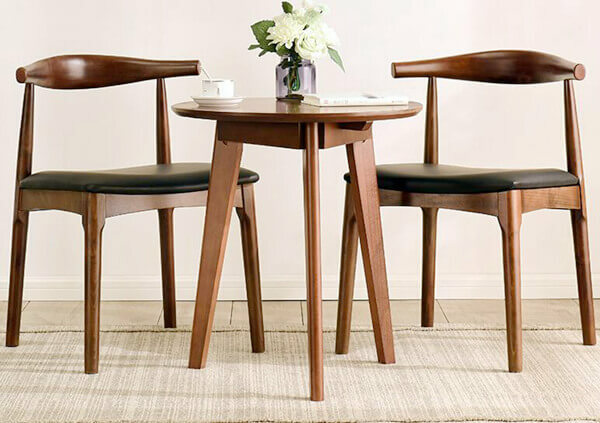 » Next: where to buy dining chairs online?